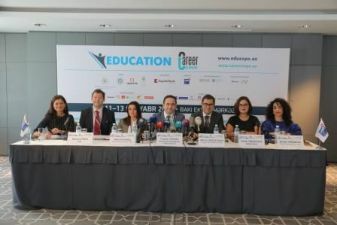 The press conference dedicated to the opening of the 12th Azerbaijan International Education Exhibition was on 10 October at 11:00 a.m. at the Hyatt Regency Hotel. The press conference was attended by Mr. Jasaryat Valehli - Sector Director of the Ministry of Education of the Republic of Azerbaijan, Mr. Edward Strachan – Caspian Event Organisers, Mr. Bahruz Hidayatzade - Executive Director of Caspian Event Organisers, Mrs. Gunel R. Farzaliyeva - Kapital Bank Marketing Department and Mrs. Alina Potokina - Project Manager. 29 media attended the press-conference from ATV, AzTv, Azertag, CBC, ITV, Real Tv, Lider, Sputnik, Interfax, Report, SalamNews, TREND and other agencies. During the press conference, journalists were informed about the participants, the record-breaking statistics of the exhibition.